Stamp auctions are a great way for philatelic traders and stamp collectors to buy and sell stamps. Established in 1958, Warwick & Warwick have been organising stamp auctions for almost 60 years and have built up a considerable worldwide reputation for our expertise during that time. Having grown to become one of the most respected stamp auction houses in the world, we now play an essential role in this collectables industry for collectors and stamp dealers alike. We hold a worldwide database of regular customers and our monthly stamp auction is well attended. Each one of our regular philatelic auctions contains a large selection of miscellaneous lots from around the world. We also offer stamp collections which are intact and have often taken years to assemble. Whether you want to buy rare stamps or sell rare stamps, our philatelic experts can cater for all your stamp and postal history requirements. We are more than happy to issue free advice. Why not contact us to discuss your collection. We can also provide you with professional stamp valuations – they are free of charge and there’s no obligation to sell. With individual lot prices starting from a few pounds and rising to many thousands, our stamp auctions and postal history sales really do have something for everyone. Put our philatelic experience to the test, call 01926 499031 and get in touch with our stamp valuers today. G.B. The 1840 “V.R” Official was prepared for use in 1840 but was not issued. A very scarce unused block of four, a marginal pair and a single, were sold in the Warwick & Warwick April 2015 auction, realising £31,800; £17,100 and £5,800 respectively. What types of stamps do we sell? If you are interested in buying rare stamps at one of our philatelic auctions we hold monthly sales throughout the year. As well as offering stamp collections, single items and sets, we also sell covers, proof material and other items of postal history. Our popular sale items include GB and British Commonwealth collections, covers, thematics, Far Eastern issues, early original collections, revenue stamps, fiscal stamps, Cinderella stamps, first day covers and presentation packs, imperforate stamps and miniature sheets. Stamp values can be a difficult thing to ascertain. At Warwick & Warwick we have more than five decades of experience. You can trust that our stamp valuers will always aim to achieve the maximum possible returns. If you’re thinking about selling your entire stamp collection or even just part of it, visit our guide to selling stamps for more information. Or call 01926 499031 and speak to one of our stamp experts– they’ll be happy to give you free advice on how best to market your collection. USA. 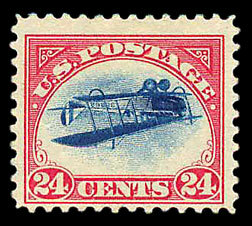 1918 “Inverted Jenny”, one of the most famous stamps in the world. Warwick and Warwick sold a mint example in our March 2009 sale. It realised £184,000 including the buyers' premium. When do our philatelic auctions take place? We hold 12 public auctions per year which are always well attended by stamp dealers, philatelic collectors and postal history enthusiasts. In addition to this programme, we occasionally hold single specialist sales for vendors with significant collections. All of our philatelic and postal history auctions start at 12 noon. Click here to view the online stamp auction catalogue, once it is uploaded, and place bids on any items in the sale. Bids can also be placed by telephone or email. G.B. 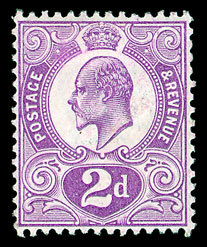 1910 2d Tyrian Plum, sold by Warwick and Warwick in our October 2012 sale from the collection formed by Commander Hugh Simpson. It realised £48,300 including the buyers' premium. Where do our philatelic auctions take place? All of the sales we organise take place in the Ballroom of the Court House, Jury St. Warwick, CV34 4EW. Located on the south side of Jury Street, at the intersection of Castle Street, the Court House is also the Tourist Information Centre and is located on most maps with the letter ‘I’. There are a number of car parking options nearby. For detailed directions please visit our How to Find Us page. The Gian Maria Rossi collection of G.B. overprints was offered for sale by Warwick and Warwick in June 2005. The lots assembled included one of the most important collections of Niger Coast seen on the market. This included the above cover-1893 (Dec) reg. 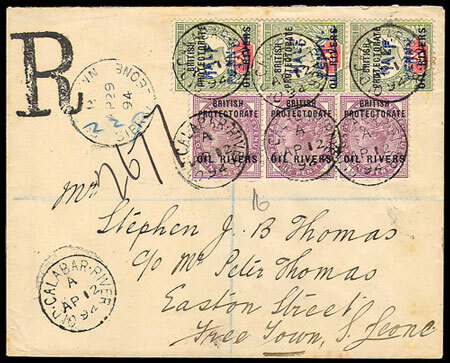 cover from old Calabar River to Freetown bearing 3 of 1d lilac (SG2) and vertical strip of 3 of HALF PENNY on 2d in blue (SG30) - the largest known multiple. It realised £5,290 including the buyers' premium. Stamp dealers and members of the public who want to make a first-hand inspection beforehand can arrange for a viewing at Chalon House in Warwick. Please note there will be no viewing facility outside these periods and viewing is not available at the Court House Ballroom. However, if you want to buy rare stamps in one of our stamp auctions, it is not actually necessary to attend the sale in person. To help make the buying process easier, commission bids can be placed in advance. You can do this by using our online facility, over the telephone, by post, fax or email. Bidding agents also attend our sale who can act on your behalf. Please visit our Online Catalogue for further details on how to buy rare stamps at auction. To receive a free printed catalogue or apply for a catalogue subscription, please complete our catalogue enquiry form, send us an email or call us on 01926 499031. Please note that our printed catalogue contains far fewer illustrations of lots than the online catalogue and unless you plan to attend the sale in person you will be better served by viewing the online catalogue. When do I receive my stamps? 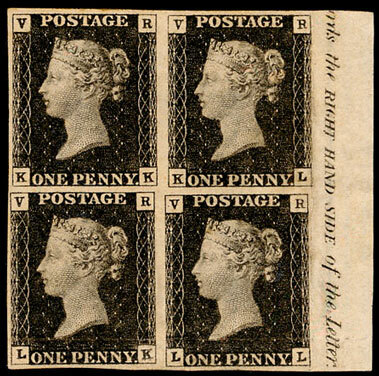 In all of our stamp and postal history sales, account settlement and lot allocation takes place progressively in our premises whilst the auction continues. This means that as soon as the section which interests you has been knocked down and completed, you are free to pay and collect your lots without waiting for the end of the sale. The only known example of the G.B. 1967 Discoveries 1/9d “missing gold (Queen’s head)”, was sold by Warwick and Warwick in our December 2014 auction. It realised £23,600 including the buyers' premium. With over 100 years of combined experience in the philatelic industry, our stamp and postal history team are one of the most experienced around. That means you can sell rare stamps with 100% confidence that your material will achieve the maximum possible realisation. If you wish to buy from our auction we will be pleased to execute bids and advise potential purchasers accordingly. If you need free advice on any aspect of buying or selling philatelic material please contact us today. Email info@warwickandwarwick.com or call 01926 499031 now.